Libreoffice 5.1.0 was announced last week on the Document Foundation blog. Which is why I make this new 5.1.0 release available only on Slackware’s own bleeding edge: slackware-current. Spreadsheet Functions: Calc’s formula engine has been improved with features addressing restrictions in table structured references and sticky column/row anchors, interoperability with OOXML spreadsheets and compatibility with ODF 1.2. The issue was the “–bwlimit=1M:” parameter I added in an attempt to reduce the monthly bandwidth usage which had grown to extremes and was costing my sponsor a lot of money. When rsync runs in daemon mode (from inetd) that parameter does not accept ‘G’ or ‘M’ to indicate gigabytes or megabytes; it only accepts a number which is interpreted as KB. I changed the rsync line in /etc/inetd.conf and rsync is working again. I can’t understand. 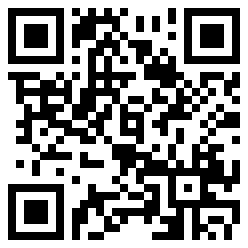 I’ve dowlnoaded the txz packages and upgrades my 5.04 version. But when I run libreoffice from a terminal only get the splash screen of Libreoffice for a while ans a message sais “Aplication Error” in the trerminal. Y tried deleting my .config/libreoffice directory and no results. Gerardo, what version and architecture of Slackware? Some of the pulldown submenus.do not have mouse control. For example the menu to select the icon style (oxygen , tango, galaxy, etc…) is not mouse selectable. Keyboard arrow keys +Enter works but not the mouse click. some other submenus have the same.problem . I didn’t notice this until after installing qt5 which vlc2.2.2 required. AB, thank your for all your hard work and yeoman’s service to the Slackware community. 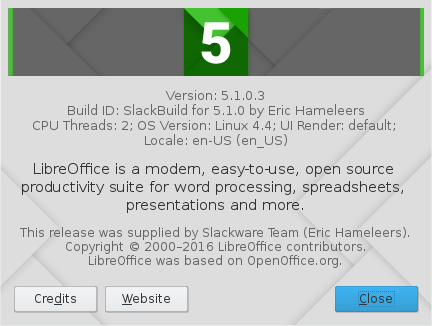 Pursuant to the menu problem I got the LibreOffice 5.1.1.1 rpm and installed it as in parallel to your previous build of 5.0.4. Both are working fine and don’t have the menu problems. I havent dared try qt-5 again yet though. Sam, I can not help you if you don’t tell what mirror you are using or where you downloaded the package. Hi Alien thanks for your reply. I’m using Slackware (upgraded to current version) 32 bits. And KDE 4.14.6. Successfully upgraded. So far, so good. Thank you Eric! Thanks for the update. But, am I the only one seeing a lot of problems in this version? The most annoying one is that I cannot reorder slides in impress (drag action doesn’t drag, just selects, in any view mode). And it also feels much slower for many actions. Previously I was using lo 5.0.4 provided by sbopkg, but started to crash after some ‘slackpkg update’. zaskar, your issues can certainly be real, but perhaps you are using functionality that others have not yet touched. If you are seeing regressions or actual bugs it would be a good idea to open a bug report in the LibreOffice bug tracker. That’s the only way to get them noticed and addressed by the developers. I’ve downloaded and installed the rpms for version 5.1.1 from libreoffice.org and they worked ok, but your version looks a bit different in many visual details. I’m just guessing but is your version using gtk 3 instead of gtk 2? That would explain the differences and the bugs. Hi Eric. I’ve found a solution to install LibreOffice without errors, I’dont know if it’s right. I’ve downloaded the rpm packages from the Libreoffice oficial site and after I’ve run rpm2tgz over all off them. Finally I’ve installed all the tgx pakages with installpkg normally. Untill now I have no errors.